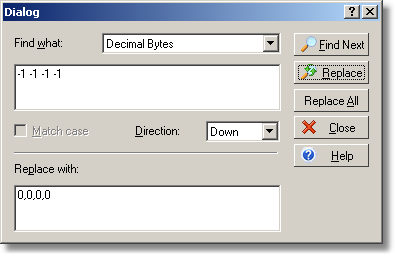 This command replaces occurrences of binary or text data with the specified data. Select the data format and enter the appropriate data in the Find What and Replace With fields. Separate numeric values with commas and/or spaces. The search goes from the current position to the beginning or to the end of the file depending on the selected direction. The Find button finds the next occurrence, the Replace button finds and replaces the next occurrences, and the Replace All button searches for and replaces all the remaining occurrences until the end (or the beginning) of the file is reached.